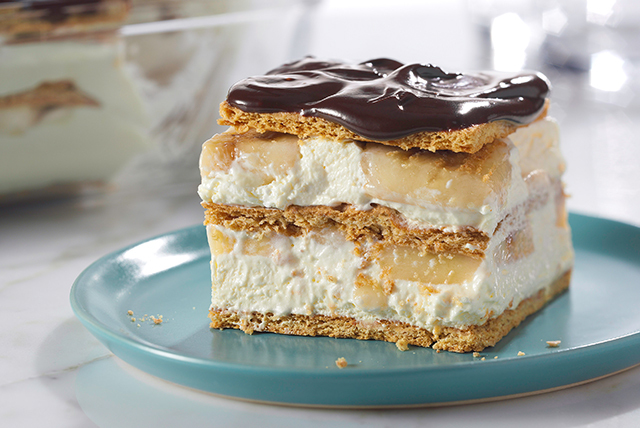 Get out graham crackers for this No-Bake Banana Éclair 'Cake'! No pastry chef credentials required for layers of deliciousness in our banana éclair 'cake'. Beat pudding mix and milk in large bowl with whisk 2 min. Let stand 5 min. Meanwhile, cover bottom of 8-inch square pan with 10 graham squares, overlapping as needed to form even layer. Stir 2-1/2 cups COOL WHIP into pudding. Spread half over graham squares in pan; cover with layers of half each of the bananas and remaining graham squares. Repeat layers of pudding mixture, bananas and graham squares. Refrigerate 3 hours. Microwave remaining COOL WHIP with chocolate in microwaveable bowl on HIGH 1 min. or until chocolate is completely melted and mixture is well blended when stirred; spread over dessert. Refrigerate 15 min. Prepare using 1 pkg. (1 oz.) JELL-O Vanilla Flavor Sugar Free Fat Free Instant Pudding, fat-free milk, low-fat graham crackers and COOL WHIP LITE Whipped Topping.